Entering into Putrajaya is like visiting a totally new country of its own. This is one of the nicest places I've seen in Malaysia. Putrajaya is an awesome sight. The minute we entered Putrajaya, I noticed immediately the unique lamp posts on the street, the superb examples of architecture, and the clean surroundings. 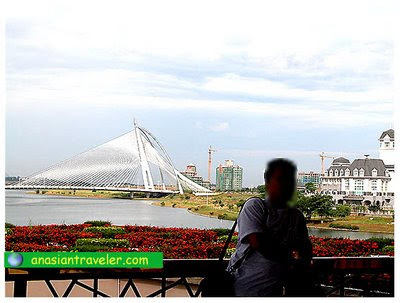 Putrajaya is an administration centre of Malaysia that is located in the Multimedia Super corridor (MSC) area. It covers an area of 4,931 hectares of land, situated 25 kilometers from the capital city of Kuala Lumpur in the north and 20 kilometers from Kuala Lumpur International Airport (KLIA) at Sepang in the south. The development of Putrajaya marks a new chapter in the history of modern city planning in Malaysia. It is set to be a model garden city with sophisticated information network base on multimedia technologies. Termed as Malaysia's first Intelligent Garden City, Putrajaya will become a vital development catalyst due to the role it will assume as a model city - as the nerve center of the nation and an ideal place to live, work, conduct business and engage in sports and recreational activities. "Putra" means prince, while "jaya" means excellent or success. The Putra Mosque, or Masjid Putra in Malay language, is the principal mosque of Putrajaya, Malaysia. Situated inside Putrajaya, next to a lake, it incorporates Islamic architecture from countries such as Turkestan, Kazakzstan and Morocco. The mosque is huge! It consists of 116m tall minaret and can accommodate 15,000 people. One of the striking features of the minaret is that it was designed after the Sheikh Oman Mosque in Baghdad. Within its premises are the VIP Room Gallery, the Al-Quran Manuscript Museum, a library, auditorium and exhibition hall as well as seminar room. It also has a large courtyard called the Sahn dedicated to commemorate the life of the Prophet. The main entrance to the mosque is patterned after the gates of Persia. Twelve columns support the 36 meter diameter main dome. In front of the mosque is a large square with flagpoles flying Malaysian state's flags. This is the courtyard of the Putra Mosque. All the women including our group were asked to wear these pretty-in-pink gowns in order to be admitted. Free entry, open everyday from 9Am to 5PM. Non-Muslims may not enter the mosque building itself during prayer hours. This Sri Wawasan Bridge is a two-tier bridge based on the Islamic design of the Khaju Bridge at Isfahan, in Turkey. The futuristic cable-stayed bridge which has a sail ship appearance, connects Precinct 2 on the Core Island to the residential area of Precinct 8. 280 meter in length, its upper tier is used for normal traffic flow while its lower tier is designed as a service tunnel, for light train transit system and a pedestrian walkway. The Perdana Putra is a building complex in Putrajaya which houses the Malaysian Prime Minister Office complex. It is one of the most distinguished landmarks located next to the Putra Mosque, over looking the main boulevard, the Putra Lake and also the Sri Wawasan Bridge. The structural design is influenced by Malay, Islamic and European cultures such as Palladian and Neoclasscism. The European styled Istana Darul Ehsan aka Darul Ehsan Palace is one the official royal residences of the Sultan of Selangor. Although the exterior is plain grey in color, opulent to the highest degree, the interior is done in gold, cream and subdued yellow. The grand doors open to a large lobby constructed in a semi-circle. Istana Darul Ehsan is split into six story and serviced by lifts. There are number of rooms within the palace including the sultan's well-guarded private quarters and his personal library. The grand lobby area of Istana Darul Ehsan, is made out of glossy marble floors offer a mirror image and are spotless clean. This building is not open to the public. 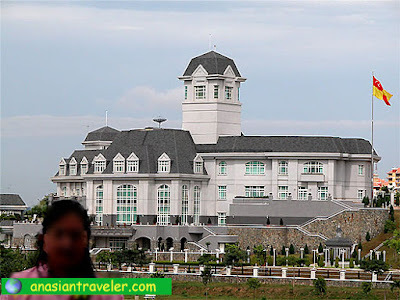 The Menara PjH, the Putrajaya Holdings Sdn Bhd Headquarters, is a stunning headquarters for the developer of the new federal administrative center. Situated strategically in the centre old Putrajaya development area, just adjacent to the famous lake in Putrajaya, the building offers a beautiful scenic view to the tenant. Standing tall with 9 storey high and decorated in light brown color with unique glass windows. 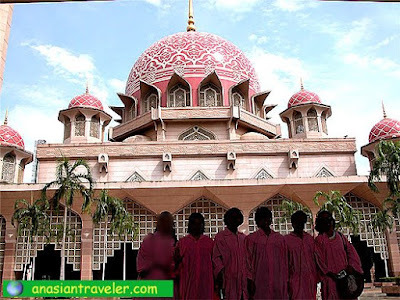 Putrajaya has now become a very famous tourist attraction in Malaysia because of its uniqueness. This place really totally amazed me. I was often caught gaping at it in sheer fascination. Public transportation within Putrajaya is woefully inadequate as distances are long and you need wheels to get around. I suggest you join a guided tour.